It's polite to meet your meat at Terminus. Season 4 of The Walking Dead introduced us to a group of fine young (and old) cannibals at Terminus, a camp that falsely promises salvation. Though we wouldn’t want to meet any of them at lunchtime in a dark alley, we can’t deny that the residents of Terminus are essentially the cannibal—Pat LaFriedas of the postapocalyptic world. Here, a few lessons we picked up from watching the Terminus butchers and cooks in action. 1. Cook with live fire. As we saw in both the Terminus camp last season and in the most recent episode with poor, poor Bob, live fire is the best way to cook any meat, whether it’s some unfortunate person’s barbecued ribs on a grill or Bob’s leg on a spit. 2. Use the whole animal. If the camp at Terminus is any indication, a human body doesn’t go nearly as far as other whole animals, or cannibals are just wasteful. Between the massive pile of human bones outside the camp, the warehouse full of butchered body parts and the fact that they were ready to butcher eight more victims in the premiere of Season 5, it’s clear that these people go through a lot of meat. 3. Kill quickly. Even cannibals know that meat tastes better when the animal is killed quickly and humanely. Instead of shooting prey, the Terminus butchers first knock their victims out then slit their throats and bleed them out into a trough. 4. Age for flavor. If you’ve ever been to a great steak house, you know that the older the steak the better (and more expensive) it’s going to be. The Terminus crowd is well aware of this, and lets their skinned human torsos and legs hang in a warehouse, presumably to develop depth of flavor. 5. Think about where your food comes from. 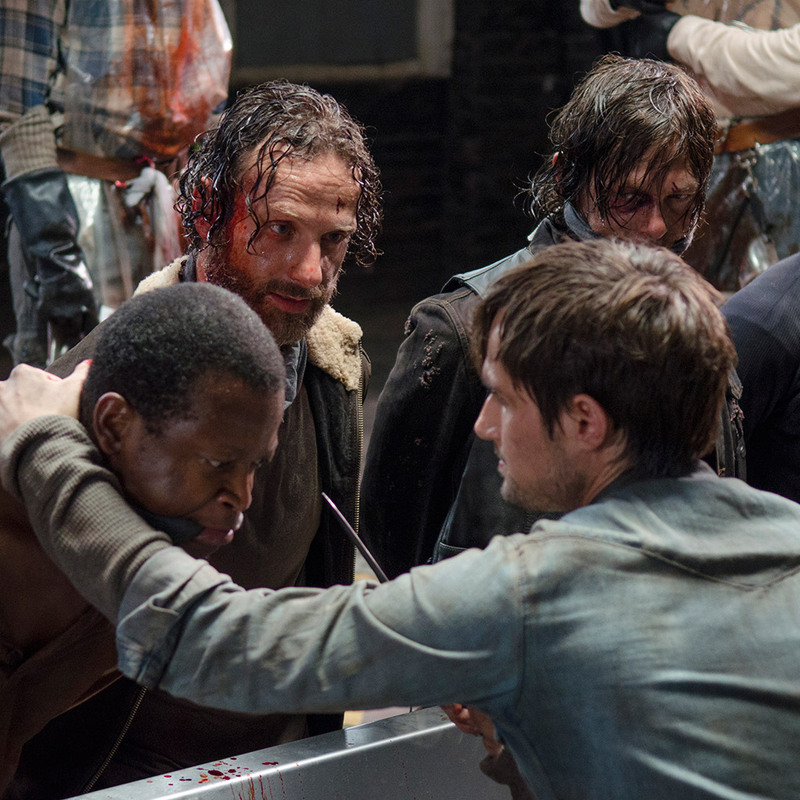 As one of the Terminus residents explains to the show’s heroes, “The more people become a part of us, we get stronger. It’s how we survive.” Truer words have never been spoken. 6. Simple seasoning goes a long way. In the second episode of Season 5, we saw Gareth and the other escaped Terminites noshing on Bob’s spit-roasted leg with no sauces or salts in sight. And they were enjoying that tender meat with relish. Sometimes the only flavor you need is the char from the fire.